Or you could just use Nested Sets. I think I read that a while ago. But doesn't this mean that you have to do a lot of work when you add items to the tree? Now put few thousand nodes in your tree giving it some depth and calculate, how many records you'll have in UsersGroupsHierarchy. Heirarchical data is a natural phenomenon in so many models. There's a couple of great ways to implement it. 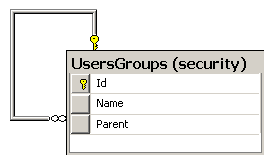 One of the nicer approaches I have tried has a table with at least 3 columns: the ID, the Parent ID, and a varchar column that has an ordered collection of IDs representing the "Path" of IDs starting from the root to the current row, in a pipe delimited format. If you maintain and persist this path as a pipe delimited string, you can have very fast string-comparison searches for finding the children of any node in the tree. Then again, this kind of plan is optimized for high-read, low-update scenarios so your mileage may vary. H, where H is the height of the deepest tree. Assuming that in most cases we are fairly flat, I don't see an issue. It also tend to affect only the changed rows, nothing else. As far as I can tell there are 3 main methods for dealing with trees in SQL: Adjacency List, Nested Sets, and Materialized Path. Joe Celko has a section on nested sets etc in SQL for Smarties. He also has a whole book called Graphs, Trees and Hierarchies which may be worth a look (haven't read it myself). Server™ 2005: T-SQL Programming by Itzik Ben-Gan et al. H? How come? Did i misread it and you don't have all possible indirect path element relations in database i.e. if it would be a family tree grandson would have entry for grandfather, grandgrandfather etc? True, one of those annoying trade-offs :-) Ideally, support should be at the mapper level (like RoR has) - something we have on our backlog for LightSpeed 2. Yes, that is the H I was talking about. Times however items you have. Again, assume shallow hierarchies are common, this gives you 2 - 5 rows per item, worst case. For ~4000 groups, with average nesting level of 7, you get ~26,000 rows in the association table. We are using the approach of Nested Sets as Andrew pointed out. It makes filling the table in the database a lot harder to implement, but makes the querying a lot faster. Hierarchical structures in the DB are a pain to deal with. I hope that when NHibernate uses an AST approach, each DB driver can handle this transparently. With that you can write normal SQL queries to fetch data from it. You can also pre-calc the hierarchies with a trigger which comes down to what you're doing more or less. The downside is that it's less logical. Celko's approach of a tree with adjacency lists (a tree is a graph after all), makes it very easy to do. Inserting is a bit of work, however that's no different than you have now. Materialized paths is what we used in our CMS and which looks similar to what you have. Supporting this in an o/r mapper ('fetch the hierarchy efficiently') is often a nightmare, because the user has constructed a naive table structure (i.e. with an FK to self). Fetching that efficiently is a single table scan and building the tree with an O(n) algo by traversing the set once, using a dictionary for bookkeeping. But often people don't want the whole hierarchy, just a part of it, and then the problems begin. I was talking with my brother about this sort of thing in the context of site maps in a database, and he pointed me to the following article which is a very interesting aproach. Maybe worth a look? This approach gives you easy querying capabilities. In addition to that, if you want hierarchy with a certain part, you can easily define it with a level column, and use that to limit the query, no? Correct. The downside (IMHO) is that you have to precalc the paths (if I understand your approach as the same as materialized paths) after insert/update, but after that it's pretty easy. If not a lot of mutations take place, it is an easy way of doing hierarchies in db's. A level column might increase the # of recalculations of the paths I think. I think Common Table Expressions (CTE's) are what you're looking for here. IIRC, it's part of ANSI standard SQL and is implemented by MS Sql Server 2005 and Oracle, not sure about MySQL and Postgres though I suspect that MySQL doesn't have support for it and postgres probably does. Anyway, what if you just use this either as a stored proc to serialize to XML, write the sql yourself, or spend the 30 seconds it would probably take you to add this functionality to NHibernate or something? I would argue that databases are capable of handling this and querying data on it much faster than any code anyone could write (unless you're doing it in assembly by hand, but who wants to do that?) and it allows you to use your simple model with one table. I'd have to check the query plans to be sure, but I think you'd also save a table scan by using a CTE instead of joining on another table like you are. I would be pleased if you spend the 30 seconds to add this to NHibernate, I promise to apply the patch. And CTE are be no means commons across databases. For instance, oracle doesn't support CTE, but uses the connect by syntax. I'd love to add this to NHibernate but it would take me a lot longer to do than it would take you. I recall a time in devteach when you added a feature to (I think) Castle and blogged about it during one of the presentations, so I was just joking about your superhuman ability to write code quickly. I've actually strongly considered fixing all the Oracle support in NHibernate because that is what's stopping us from using it (there are a few other trivial things that would also be easy to fix) but I haven't had the time yet and all the Oracle connectors that exist for .Net have crappy support for CLOBS (CLOBS = NTEXT for those non-Oracle people reading this) just to name one thing that I have about them. I know Oracle doesn't explicitly support CTE's but my point was that the concept of CTE's is supported across both databases. I'll add NHibernate to the list of projects that I'm working on in my spare time, but I think for now my linux projects are taking priority because of what I'm trying to do for my home network. Pardon my ignorance, if I haven't understood the problem correctly. Can this thing be solved in a way that is similar to an enum? So, a user with all the rights is combination of Administrator + DBA + SQLite DBA (similar to enum with FlagsAttribute). Once again, if I have misunderstood the problem - I apologize. A member of the DBA group is a member of the Administrator group. And those are flexible at runtime, not hard coded.